The credit card loan is recurring in nature. Once you pay on credit, you can clear the debt and make another loan under the predefined amount. It should be an ideal way to spend when you need, however, going cashless can easily lead to overspending, and piling up credit card loan will boost the interest expense. Want to reduce the interest expense of credit card loan? Personal instalment loan offered by bank is a helpful ways to repay your loan before payday. It is a type of borrowing to be repaid with interests over a designated period of time by regular payments. It is unsecured in nature which means no collateral or guarantor is needed. Using a personal instalment loan to repay several credit card loans collectively is a fast and effective ways to clear all debts. The China Construction Bank (Asia), having 50 branches in Hong Kong, provides a wide range of reliable banking and financial products and services. The bank also offers personal instalment loan and balance transfer programme to consolidate your outstanding credit card loans, helping you to repay all debts painlessly. With this personal instalment loan, you will be entitled to a lower interest rate and supplied with extra cash for any financial needs. Apart from credit card loan repayment, it can also be used on everyday spending or ad hoc events such as wedding, medical care or apartment down payment. The bank provides a monthly flat rate as low as 0.18% and the annualized percentage rate of 3.32%, both significantly lower than their counterparts in credit card loan. Borrowing through the China Construction Bank (Asia) involves no handling fee. With the maximum loan amount HKD1.2 million, borrowers can spread repayments over 60 months, which means flexibility and liquidity in time of urgent need. CCBA’s personal instalment loan is convenient to apply. There are several ways to sign up for the loan. Enjoy Instant approval and same day funds disbursement to your designated bank account by applying in person at the Personal Loan Centers and submitting all the required documents at the same time. It guarantees approval without delay. The application can also be done via the hotline and the bank’s webpage. Simply fill in basic personal information, the expected amount of loan, and the credit period needed. The information will then be handled by our professional Personal Loan Centre Manager and contacts will be made as soon as the review of borrowers’ credit ratings is done. Apply online before 31 March 2018 to receive supermarket cash coupons of HKD$500. 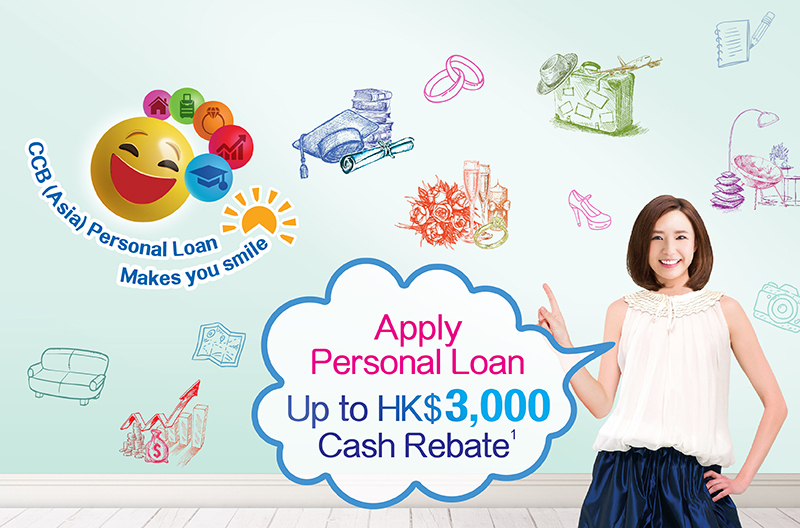 Enjoy up to HK$3,500 cash rebate via loan drawdown and signing up of designated banking services. Clear all credit card loans now through our personal instalment loan. Pay less, enjoy more!